On Thursday morning, January 11, 2007, I had an unusual after-death experience or sign. Two days prior, on the ninth of January, my husband and I met with a lady who had lost her 19 year-old son Brian. He died in a freak accident in which he was struck by lightning and died three weeks later. We talked for over two hours and told her many of the stories about our after-death experiences, many of which included finding pennies after mentioning our son Eric or thinking about him. My husband and I had been talking about the Tuesday meeting on Wednesday evening before we went to bed. As I lay in bed that night, I was feeling sad. I felt the pain of another mother having to lose her son and cried for her son, Brian, and my Eric. I said my prayers and asked for Brian and Eric to give us some signs. I prayed for my Mom and Dad and all of my passed relatives, my spirit guides and angels who could help us get some signs from them. I finally fell asleep. At 2:30 a.m., I woke up to go to the bathroom (as usual) and then again at 4:28. This time I walked into the dark bathroom, did not turn on the lights, and started to sit down. As I was just sitting down something hit my right shoulder and hit the floor. I felt it then heard it. I couldn't see anything. At first I was scared, not being awake at all. I sat down and popped right back up and turned the light on real quick. I look down and there was a penny laying on the right side of the toilet on the floor. I bent over and picked it up, and said "Thank You," cried a little and woke up my husband Fred right away. I verbally repeated the exact experience with the penny in my hand and we were both assured once again that these events are purposeful, spontaneous, and meant to give comfort even though there is no earthly explanation of how this could possibly happen. In my work with EE's, I have classified them in15 types of encounters from sensing the presence of the deceased (a rather common event), smelling an essence associated with him or her as well as hearing, seeing or being touched by the person. A number of EE's also happen to third or fourth parties who then relay the message to the mourner. Messages are also believed to be conveyed through dreams and natural symbols like rainbows, butterflies, birds or through unexpected movement of physical objects. Any of these unexplainable happenings may occur shortly after the death of the loved one or months or years later. One or several combinations of the above have been experienced by many bereaved persons. It has been estimated over 70 million people have had the experience. People from all walks of life have reported extraordinary experiences. I have interviewed and received letters from college professors, secretaries, housewives, airline pilots, salespeople, medical professionals, and students to name a few. Individuals from all races and creeds, celebrities as well as the not so famous, rich and poor have had contacts of some sort. History is filled with incidents in which some form of unexpected acknowledgment or communication has occurred from unknown or unseen sources. The experience often takes place within the first several months following the death of the loved one. However, some have had the experience many years after the death of the beloved and it still helps them fill the void in their hearts, complete unfinished business, or become convinced consciousness survives bodily death. There is often the need for validation and understanding from significant others in the social circle of the bereaved. In order for the extraordinary experience to have a positive impact on the individual, it needs to be recognized by family and friends as an encounter in which the mourner is giving and receiving love. 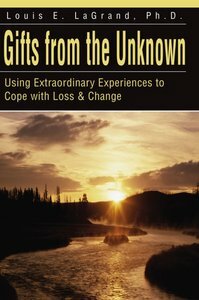 A single individual who provides support and recognizes the inherent merit of the experience can make a major difference in the way the bereaved copes with the death of a loved one.